Japan’s most potent psychedelic rock quartet BORIS have just locked down their next North American escapade. After many previous tours to the continent, superheavy post-doom-rock unit BORIS will return to North America this summer in a major way, storming the continent on a tour that will last from the end of July through the month of August. Kicking off in California, the opening leg of the tour will see the band accompanied by Russian Circles as main support for the first few weeks, and by Red Sparrowes for the second leg, which also winds down in the Golden State at the end of August. But BORIS will not let a tour die off quietly…. This full tour shall take place in advance of the previously announced appearance by SUNN O))) and BORIS amalgamating to perform as ALTAR — as heard on their 2006 Altar full-length — at the third annual All Tomorrow’s Parties Festival in beautiful upstate New York, performing alongside Sleep [performing Holy Mountain], Iggy & The Stooges [performing Raw Power], Sonic Youth, Mudhoney, Raekwon, Explosions In The Sky and tons more this Labor Day weekend. Stay tuned for a forthcoming major announcement regarding several new Boris releases! 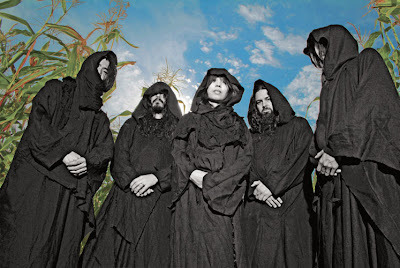 Some more information on the Boris/Sunn O))) partnership can be found here.